Semi-desert, foothills. Open grass and shrublands. Spring. These bright Forget-Me-Nots are favorite spring Canyon Country wildflowers for many wildflower enthusiasts. 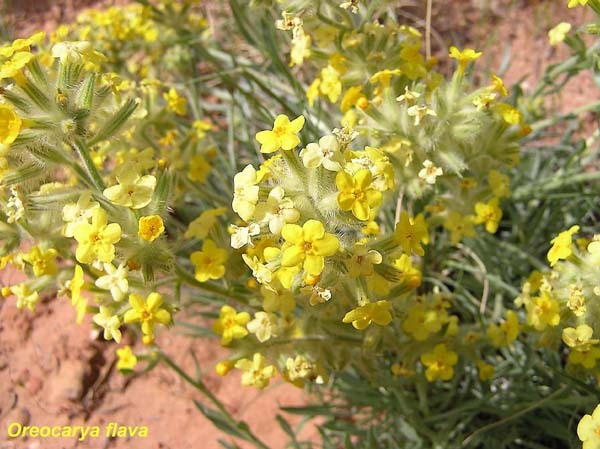 They are abundant perennials commonly found along trails in Pinyon-Juniper forests. It is pleasant to watch the gray mass of last year’s dead leaves yield to new, very hairy, light-green to sage-green to blue-green leaves and then to numerous clusters of tiny bright flowers, also in a very hairy cluster. "Oreos" is Greek for "mountain" and "caryum" is Greek for "nut". "Flava" is Greek for "yellow".